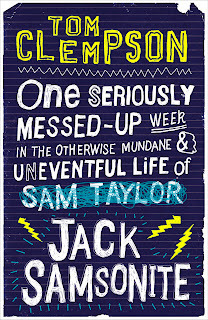 On the Big Break today we have the fabulous debut author Tom Clempson, whose first book 'One Seriously Messed-Up Week In The Otherwise Mundane Life of Jack Samsonite' is published tomorrow by Atom. I was the first person to interview Tom back in March but I held it back until nearer to publication day! It’s a pleasure. Thank you! This is actually my first ever interview, so don’t be surprised if my answers are a bit turdish. I’ll do my best though. Being published was actually beyond my dreams! I used to dream of being published, and I was never going to allow myself to give up trying, but, before I got this good news, I had all but resigned myself to the fact that it may take quite some time before it happened – maybe in my old-age, maybe after my old-age! 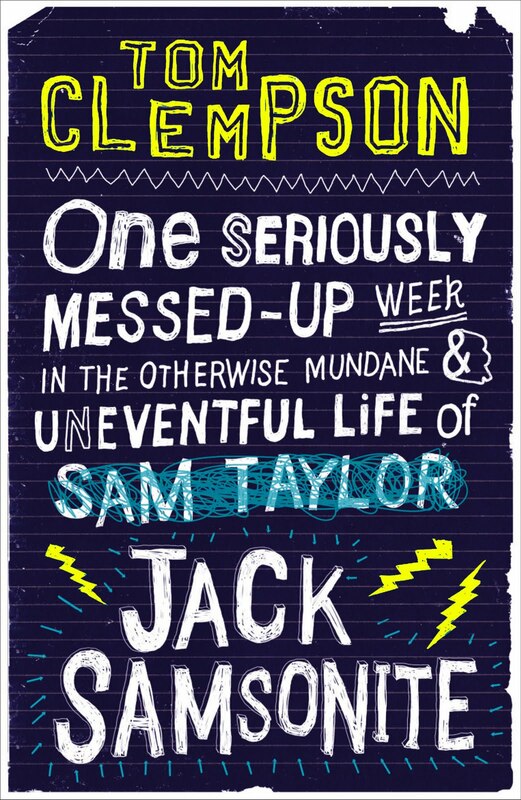 What was your first reaction when you found out that your first book ‘One Seriously Messed-Up Week: in the Otherwise Mundane and Uneventful Life of Jack Samsonite was to be published? How did it make you feel? My reaction was completely internal. I don’t think I cheered, or jumped around, or got hideously drunk. The only way I can describe it is going to sound vomit-inducingly sappy, but it was like when you find out that someone you like likes you back. That whole stomach doing somersaults thing. And it lasted quite a long time! I was at work, sitting by the canal, eating my lunch, when my wife passed me her phone to show me that I had an email from the publishers. It had been a bit of a long process and I’d had quite a few emails from them already, so getting another one wasn’t a big surprise. However, what was written in it was. My agent had warned me months in advance, when he first began talks with them, not to celebrate anything until I’d signed a contract. So when I got this email ‘officially’ welcoming me on board I was a bit confused. It said official! But I hadn’t even seen a contract or heard from my agent at all. So I was desperate to celebrate, but held back, just in case. It was euphoria and torture all at once! (I did get my contract a few weeks later and the guys at work decorated the workshop and bought me a cake and stuff, so I finally allowed myself to celebrate). Who did you tell first? How long has it taken for your book to be published since the initial agreement? After that email I just told my wife, then later told a handful of people I work with, but no more than that until I got the contract. It all seemed too good to be true and I kept expecting the publishers to get back in touch with me saying ‘You know how we really liked your book? Well, we read it again and… actually it’s a piece of crap’. So I didn’t want to tempt fate by telling too many people. I got that email at the end of May 2010 and my book is published on June 2nd 2011, its pretty much taken 12 months. What has been happening to your manuscript during this time? It’s hard to remember now! It’s a bit of a blur. I think it started with getting the edit notes from the publishers, none of which were unreasonable, extensive or compulsory (they’ve been amazing from day one). Then came stage two of edit notes, which were just a few bullet points really. The manuscript was then sent to the proof reader, who picked up on all my not good wordiness, then it went to typesetting to decide how it will look on the page, then it went to print for the ARCs and that proof also went to a 2nd proof reader to pick out any mistakes that may have occurred during typesetting. And during all of this we had the cover designed and… that brings us up to the printing of the ARCs, which is the last I’ve seen of it! How are you coping with the wait for publication day? Euphoria and torture again. I’m so excited at the prospect of other people reading something that I wrote, at seeing my own book on the shelves of real bookshops, at the idea that this could be a whole new career for me! And at the same time I’m absolutely terrified that no one will read it, it won’t be on any shelves in any shops, and it could be the end of a whole new career for me. I know is sounds insanely negative, but alongside the fantasies lurk the nightmares! How did it feel to see your name on the finished book cover? Your book will be released this June. How do you plan to celebrate? Surreal. It just felt surreal to see my name on the cover. My name! And no one even asked me to change it to something less weird! And for my name to be in such large print as well?! It made me wonder ‘did the designer confuse me with someone people have heard of?’ But, even weirder than that, was when I opened the book and saw my name written at the top of every other page! It hadn’t even crossed my mind that I’d see that. It was strangely embarrassing in a way, as if my mum had published the book and wanted people to see her little boy’s name as often as possible. As far as celebrating goes, all I have planned is to find somewhere that is selling it, then go and buy my own book. Is that weird? For my next book, which I am writing at the moment, I really only get to write on the days my daughter is at nursery, which is 3 days a week. The second I’ve dropped her off I go straight to a coffee shop and begin writing. Being a typical writer I am penniless, so I buy one drink and make it last about 4 hours! Luckily they don’t seem to mind, and if I do ever own any money then I’ll try to make it up to them (I’ll buy two drinks). Then I take a lunch break and then return to a coffee shop to continue writing until nursery unleash the mini-beast. I am able to work at home, but it’s difficult. First of all I have to ignore the multitude of distractions that beckon me out to play, and secondly my wife and baby son are usually at home, and I just feel too mean shutting myself away and ignoring them for hours on end. If I’m out of the house it’s different, I’m at work. In a perfect world I’d have a tree house. a) I could go on and on about what I’ve learned and how I came to learn it and all the theories I’ve devised along the way. b) I’m just a debut author whose book may be tomorrows Amazon packaging. My advice could be your downfall! c) Everyone seems to have their own unique style, techniques, methods. What works for me might not work for anyone else. Which brings me on to my No.1 piece of advice (I couldn’t resist!) and that is – always rate your own advice above that of others. We can listen to self-important authors babbling endlessly about how they found all the things that they think make them unique, but if we take what they say as bible, then we’re probably going to churn out something a bit like theirs. Something that is no longer unique. Take that good book that you know you have inside you and ask yourself what is the best way for you to get it onto the page. Use your own instincts, your own style and methods and follow your own honest advice and you should end up with something that is genuinely unique. It’s a long process, it doesn’t always work first time, and some times you feel like you are failing over and over again. Keep at it. You’ve only failed if you’ve given up. Thank you Tom for taking the time to join us today. We all wish you the best of luck with publication and look forward to seeing more of your books on the shelves. Tom's book goes on sale tomorrow. 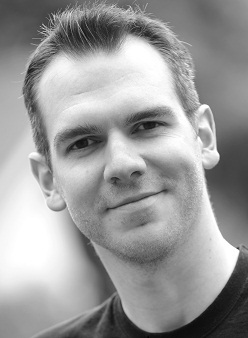 If you would like to know more about Tom and his writing, then visit him at his blog here. Tom is not the only talented person in the Clempson household. I have to mention his lovely wife Laura who is a professional crafter who has a craft book out at the moment called 'One Stitch At A Time'.If you would like to know more about Laura, please click here. Great interview! I will make sure I take a look at this book. This is one of your best Big Breaks yet, Vivienne. I enjoyed it so much! The author does a wonderful job describing his reaction to the news, his writing habits, and his feelings. I like his "advice", too, which says that we should listen to ourselves and be unique. great great interview, as an aspiring author I took alot of heart from this post. I have read Tom's book and I have to say its BRILLIANT! Nice interview, the author seems very down to earth! Very cool that you got to do his first ever interview Viv. One Seriously Messed-Up Week sounds good. Cute badge his wife made for the book too. Yet again a wonderful interview, Vivienne! I think Tom did great on his first interview. His book sounds like a fun read. It doesn't sound weird at all going out to purchase his own book. What a wonderful feeling it must be paying for the book and on the inside bubbling over with pride and joy because it's his very own book. Right from the start, I laughed. 'Turdish'!! Everything that I've read about the book and about Tom makes me want to read this book. Fantastic.